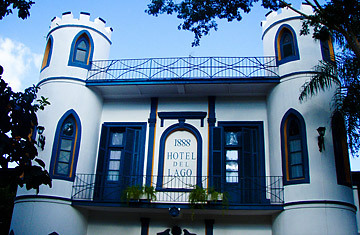 Hotel del Lago in San Bernardino, Paraguay. This post is in partnership with Worldcrunch, a new global-news site that translates stories of note in foreign languages into English. The article below was originally published in La Stampa. SAN BERNARDINO  Experiencing the Nazi legacy in South America costs just $40. This is the rate to spend a night in the best room of the Hotel del Lago, founded in 1888 on the shores of the Ypacaraí Lake, in Paraguay, in the small town of San Bernardino, 50 kilometers east of the country's capital, Asuncion. Given that Paraguay does not have access to the sea, the lake is the trendiest destination for a vacation. San Bernardino, however, is notorious as the place that sheltered Joseph Mengele, the Angel of the Death, a German SS officer and physician in the Nazi concentration camp Auschwitz-Birkenau. After Germany's defeat in World War II, Mengele fled to South America where he hid for decades. According to unproven theories, Mengele, one of the most wanted Nazi war criminals, died in San Bernardino, not in Brazil, as usually reported. Regardless, there are plenty of other phantoms from the past in this small town, which was founded in 1881 by five German families, and still hosts a German Mennonite colony. The hotel is still very popular and has a cultural center that promotes local craftsmanship. But behind its quiet façade and tropical setting, this village hides a long string of connections with Nazism. Passing a 19th century Teutonic-style hall, a smiling waitress walks the visitor to the best suite of the hotel, and reveals other old stories. The German architect Wilhelm Weiler designed Hotel del Lago. In one of its rooms, Bernhard Förster  husband of Elisabeth- Förster-Nietzsche, and brother-in-law of the philosopher Friedrich Nietzsche, a brave explorer but also a theoretician of anti-Semitism  committed suicide. After the failure of his project to fund an Aryan colony in Paraguay, named Nueva Germania, Bernhard chose death before dishonor. In the 1930s, Nazism became popular in Paraguay, and Förster was considered a hero to some. Adolph Hitler would later order German soil spread over his grave. Moving from the hall of the hotel to the suite, the visitor has to walk in front of Förster's room, number 19. In one of the building's small towers, there is the favorite room of one of the most powerful women in San Bernardino, the French-German Hilda Ingenohl, known as "la Tigresa," due to her passion for hunting large felines. "She was a Nazi supporter, worshiped Hitler's ideas and claimed to be his friend," says a woman from San Bernardino, who didn't want to give her name. Ingenohl's life had many chapters. She was born in Paris in 1874, and was a nurse in Europe during World War I. Flying was another passion of hers. Some say she was actually a pilot during the war, and that she was one of the first women who attempted, unsuccessfully, an uninterrupted aerial circumnavigation of the world. After the end of the war in 1918, Ingenohl moved to South America. First, she went to Uruguay, upon the invitation of Grete Goetsch, wife of the German ambassador, then, to Argentina, where she directed the German Hospital in Rosario, and finally to San Bernardino, which she fell in love with. She bought 200 hectares of land, but she spent most of the time in the room in the tower of Hotel del Lago. Today, that same room still features a king-size-bed, a closet with a mirror, and large balcony which looks over the entrance of the hotel. This was Ingenohl's small kingdom, where she planned her frequent trips to Europe. She loved classical music and founded a youth orchestra. She had even met the famous Paraguayan musician Florentín Giménez. In 1953, she got cancer and moved back to Bonn, in Germany. The hotel claims other notable  non-Nazi  guests from the past, including the French writer and aviator Antoine de Saint-Exupéry and Swedish writer Ida Bäckmann. Still, it is the link to Nazism that remains a major skeleton for both this town, and the country as a whole. Even well before Mengele's soujorn after the war, it was in Paraguay, in 1927, that the first Nazi party outside of Germany was established.